This was one of Sandi's favourite days, once we got through the first horrid bit across the highway and past the plantation. Getting over the Albany Highway felt like a huge step on our journey, like losing sight of land when sailing off. We're planning to have morning tea on top of Boonerring Hill, which we'll climb without our packs. Where has a week gone? Woke in hut to slowly dawning beauty. Another cool morning where both of us are wearing all of our clothes (part of travelling light is multi-purpose items). My mental arithmetic was wrong: it was really 36K steps yesterday. After a relaxed morning of cloud gazing, breakfasting and washing we finally got away around 9am. The walk down to Albany Highway was through some beautiful country, looked like it had been farmed at some stage? Found some lovely orchids beside the Track too. Once across the Highway we walked between a tree farm on the left and regrowth forest on the right for some time. The Guidebook pointed out that we would be able to see Boonerring Hill (our intended morning tea stop) at 5.1km at the crest of a hill: absolutely correct, though it didn't look too impressive from this point? Shortly after we spotted a Wedge-Tailed Eagle soaring above some exposed granite. We wet our bandanas in a creek that we crossed. The GPS Odometer reported different distances today... and the right turn at the corner of the property was 300m after expected. Climb to Boomerang Hill shorter and easier (no pack) and delightful 360° views, flowers wonderful and playful lizard. View from saddle great. 3 soaring eagles. Previous wedgetail eagle harased by 2 ravens! Leschanautia in patches, striped orchid before Albany Highway. Made our way across the saddle and around behind Boonerring Hill, just a little confused with the directions in the Guidebook (it didn't help that their distances weren't matching with our GPS - they were 300-400 short). Used a bit of common sense and a bit of "I don't think I want to walk up that track!" to finally find the junction of trails the Guidebook had at 8.9 (Our GPS had us already walking 9.3 by that point). Had a wonderful 50 minute stop on top of Boonerring, trying to pick out the route we'd just walked. It certainly is a glorious view from the top. The plan for the afternoon is to have lunch at the lovely sounding Boonerring Spring and maybe wash our clothes if it's suitable. Spring was dammed, so waited for "river" plus we weren't really hungry yet (water in damn bluish cloudy - ?white clay we saw causing this very deep). River turned out to be creek, but I damned it and made enough for clothes washing purposes. Also Fixamul to right heel looks ?? but feels a bit sore, very confusing. Toe has been horrible on and off all day. Lunch with better than expected bread. Identified different Eucalyptus with large nuts. 2 reddish Kangaroos. Glad of wet bandanas. Starting up again after lunch I was just about to carry on walking along the vehicle track, thinking that it was odd that someone had placed rocks like an entrance way next to the road... then, "derrr: that's our Track!" Overall lovely day but I was feeling effects of big day previous. Had a great day today -- felt sorry for Sandi who seemed to be plodding all day - but I had a zip and a skip in my step. Awful to see her fall through the camera lens. We have arrived, another younger chap here quite quiet, so that will suit us. Just noticed that the GPS is down to 1 bar on the newly swapped batteries. Previous batteries must not have fully charged: it did seem quick + FUSE still full?? So put on again -- seemed to be charging. Jarod's got a fire going, but we're not set up to cook over a fire (we've only got the JetBoil and no other saucepans), so we do our standard dinner. We probably stayed up too late chatting, but Jarod was very easy to chat to and had heaps of answers to our questions! We eventually climb the hill to our tent, which is marked by an orchid at the corner of the path :) A testing day, and we're very happy to climb into our wee bags in our beloved home-away-from-home. The Summary & Overview of our big adventure: all roads lead from here! The Foundation's Distance Tables tracked on our GPS into Distance / Time / Hours / Speed point to point. Cup-a-Soups are a great addition to the camping dinner: We scored all our evening soups. We used 42 Back Country dehydrated meals over the walk, scoring them each night (& once for breakfast): hunger sauce and discerning palates. The cafes on the track are often dreamt about on the way there: here is what we found when we got there. We used bread for our lunches on the track and found that the different types performed quite differently. When in town we tented: the facilities were very important for the upcoming sections and variable! 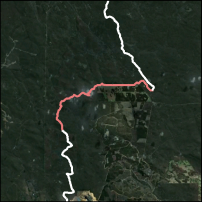 Each day's walk as a Google Earth Track, and one track of all the days combined into a single track. The 53-day walk split into the Foundation's Sections with the extra 'bits' removed; also a combined Northern Track and Southern Track. Use an integrated map, Download KMZ & GPX files, shelter photos. Over the 54 days of our treck, we took a portrait photo each morning before setting off on the day's walk and then each afternoon when we'd reached camp -- often capturing the morning's optimism and then the afternoon's pain of the journey on our faces. Photographs of the plants we found along the way: The abundant flowers, huge trees, amazing fungi and sculptured stumps. The track was an ever-present and ever-changing companion for 54 days: here it is up close and personal. The SONY made neat sweeping panoramas, which detail the changing environment over the 1,000km. We were amazed at the lack of fauna we found, what we did find is here. Any maps, GPS, photos should be checked thoroughly before heading out into the wilderness. Cookies are required to enable core site functionality. ©2019 by Mitupela Blog.